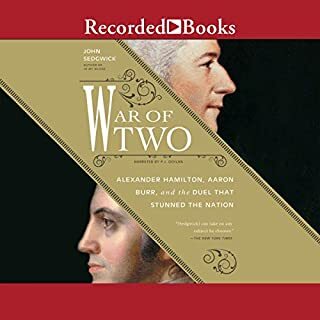 A provocative and penetrating investigation into the rivalry between Alexander Hamilton and Aaron Burr, whose infamous duel left the founding father dead and turned a sitting vice president into a fugitive. In the summer of 1804, two of America's most eminent statesmen squared off, pistols raised, on a bluff along the Hudson River. That two such men would risk not only their lives but the stability of the young country they helped forge is almost beyond comprehension. Yet we know that it happened. I loved the subject matter and writing, but the reader was very awkward. His style was overly dramatic and stilted, like a very bad news reporter.